Excellent High Quality Fiberglass, not ABS plastics. Reliable mounting system - very strong, mirror-polished, corrosion-free Stainless Steel Mounting Brackets. Great looking and about the best deal out there that we can find. 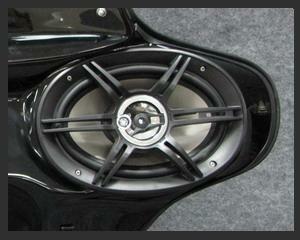 TEAK Amps also available for this Fairing, See Related Items Below. Some Bike Models require the use of Memphis Shades or OEM Brackets. Please check the bike drop down above (If brackets required they are notated with MEM----- or notated). Contact us if any questions. Model Compatibility Page. Continental US, we will ship your Fairing directly to you and Tsukayu will ship you the brackets (or adapter brackets) required for your specific application (not including the Memphis Shades or OEM brackets if required). 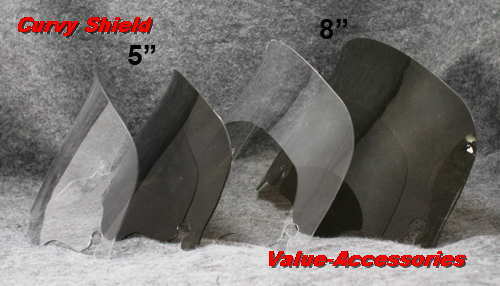 - Choice of 5", 8", or 10" Light Tint, Clear or Curvy Shields..
- With double seals between the outer and inner fairing, which makes it noise-free. 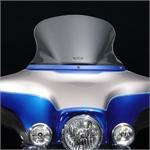 - Compatible with Harley Accessories - Harley Windshields (with 3 holes design), windshield trims, leather bra and mirrors. - 12 volt plug pre-installed. - Pre-installed built-in Radio antenna (inside the fairing). - Pre-installed wiring harness and connectors. 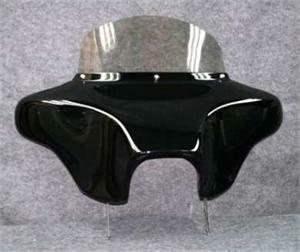 - Fiberglass, detachable outer and inner fairing. - Designed to work with stock handlebar, risers, headlight, etc. These should fit with normal 4" Aftermarket Risers. Questions, contact Tsukayu. Fitment with aftermarket any non-stock accessories is not guaranteed. - Water Proof Marine Stereo Housing with Automatic Opening Function- Super anti-shock protection (ESP) for smooth music enjoyment. These are probably the best Fairings anywhere for the money. See more information and Pictures at the Manufactures web site. Free shipping is included for Continental US. The $60 Shipping Fee that everyone pays including us is included in this price. If you are in the Continental United States, the Fairing itself will be sent UPS or FedEx ground directly from us (do not pick any other shipping, the boxes are to large for air or priority mail). For US customers this price includes the Customs Duty and Carrier Processing Fee. If you are Outside of the Continental United States, these Fairings will be drop shipped from the manufacturer in Hong Kong. If Tsukayu charges extra shipping to your country, then you will be charged the shipping rate for your country. We will adjust the rate to match exactly what their advertised shipping rates are to your country. You can see shipping fees on their web site. http://www.tsukayu.com/Strong.htm Your cost if you are outside of the US will still be less then ordering directly from the manufacturer. If you are outside of the continental U.S and these are sent directly from the manufacturer, we have to charge you immediately. You will be sent an email with shipping information from the manufacturer when your Fairing is shipped, appx. 4 to 6 weeks later (we have no control over shipping from Tsukayu). Any returns or warranty questions will be handled directly from Tsukayu. On Drop Ship Fairings, there are no refunds. Available for the following bikes and more. Give us a call for more information.